An innovative bathroom design that takes an entirely fresh approach to bathroom planning and use, the Dornbracht Elemental Spa transforms traditional bathroom spaces into a luxurious temple of relaxation and restoration. A collection that embraces clean modern lines and celebrates the fluid beauty of water, the Elemental Spa creates a unique contemporary environment. By re-evaluating how we use the bathroom, Dornbracht have divided the Elemental Spa into nine separate zones. Each zone is specifically designed to provide a sensual and complete experience, wrapping the user up in the comfort of everyday ritual. Designed by Sieger Design, the zones act like a path leading you through the bathroom. The first zone you enter is called the ‘Cabinet’, it is here that you start, gathering the towels and toiletries needed. Next you move to the ‘Facewash’ zone where you cleanse your hands and face. 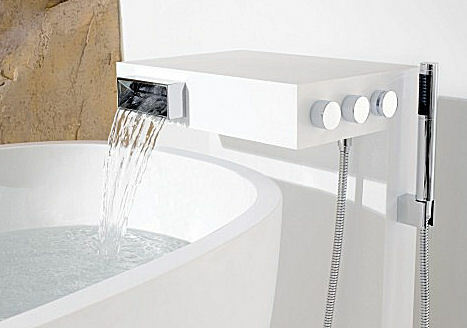 Within this zone the Elemental Spa offers a choice of modern faucets. 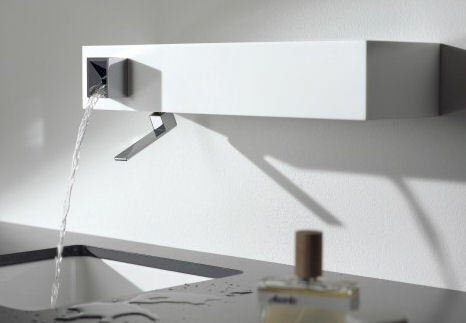 The first is the IAM wall-mounted single-lever basin mixer, a cubic design in a modern Corian housing. 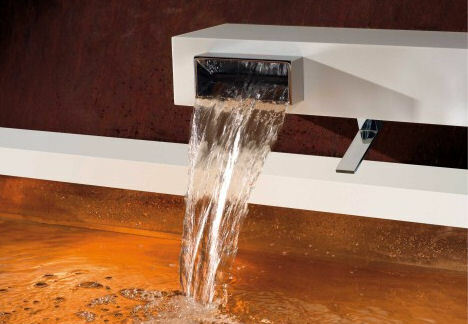 Featuring a large cubic spout, the highly reflective finish provides a clear view of the flowing water, accenting and enhancing the beauty of the fluid’s motion. Presented on the white rectangular body the gleaming fixtures add a sophisticated glamour to the Corian’s clean sharp lines. 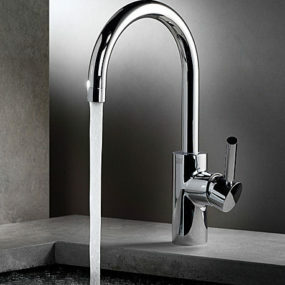 In contrast, the Dornbracht ITA wall-mounted single lever basin mixer has a bright and simple form. Reaching out from the wall, the primitive rectangular faucet releases free streaming water into the basin. 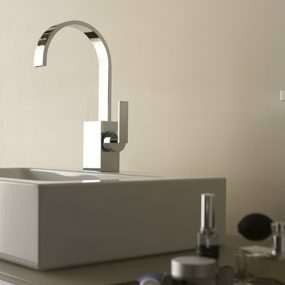 Both cubic inspired faucets feature unique slim lever controls which hang below the faucet and continue the sharp geometric theme. Capturing modern sophistication through elegant designs, the ‘Facewash’ zone becomes a sensory experience rather than a chore. Then the Elemental Spa offers a ‘Cascade’ which acts as elemental focus, letting a free-falling stream of water flow as if from a natural spring. 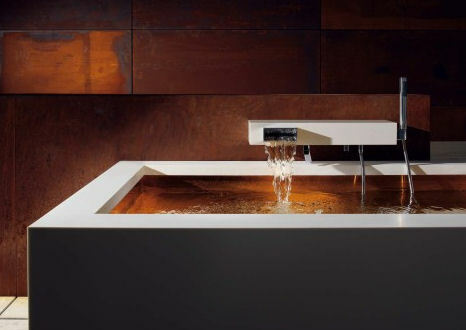 By focusing on natural elements, the cascade brings a atmosphere of calm serenity. 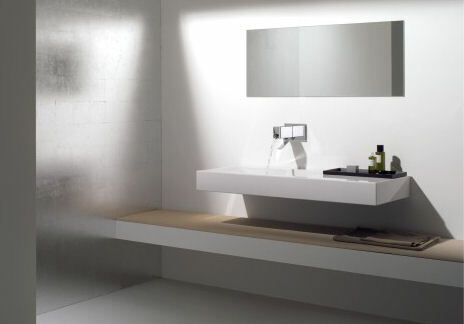 Moving to the ‘Foot Washing and Body Cleansing’ Dornbracht provides a flexible space for sitting or standing that allows you to wash either partially or entirely. 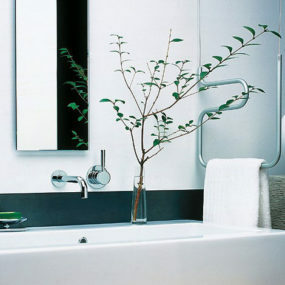 Dornbracht create a ritual that emphasises your physical awareness and soothes the spirit. 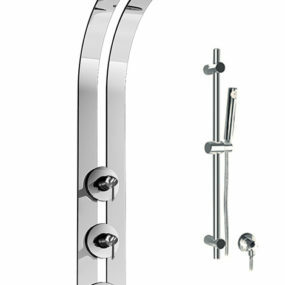 Here again, the ITA wall-mounted single-level is used to create a dynamic new feature for bathrooms. 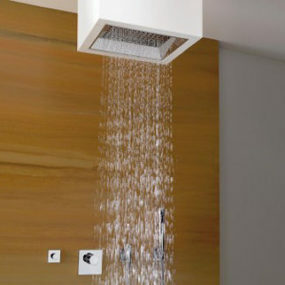 The ITA is mounted low on the wall and sends a stream of water flowing to the floor. This unusual installation creates a washing space which is intriguing and engaging, while being fantastically practical. When combined with natural materials like copper which develop an organic patina over time, the modern cubic faucet acts as a stunning contrast. The juxtaposition if gleaming metal and oxidised copper blends old world with new for a sophisticated contemporary style. 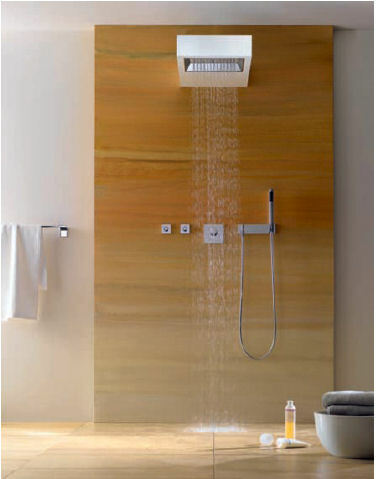 Progressing to the ‘Shower Centre’ this fifth zone releases a gentle rain like water for a refreshing light feeling. Here the Elemental spa offers a cubic design framed in a seamless Corian frame. Inside the shining white form is lined with a reflective metal, from which fires an array of small jets. The fabulous reflective finish gives the large spray head an open and clear design that accents the fluid nature of the free-falling water. 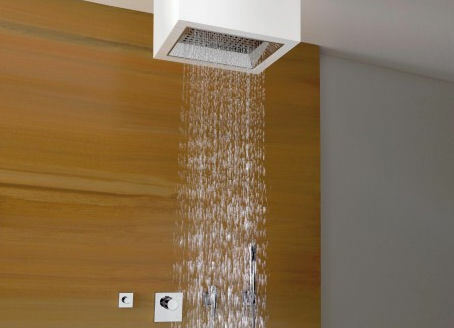 Available in two styles, the Elemental Spa’s SATI is a ceiling-mounted shower that drops simply from above, while in contrast the SANGHA is a wall-mounted shower that reaches out with its elegant Corian form to release a soothing shower of water over-head. A shower of elegant simplicity, the Elemental Spa SATI and SANGHA shower heads complement both natural and modern materials. After the rejuvenating shower, the sixth zone, ‘Bathing’, features rich and luxurious copper baths that create a sensual experience. Paired with luxurious bath fillers, the Elemental Spa baths achieve a sense of beauty from fluid motion. 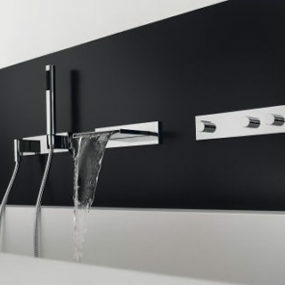 Available in two styles, the Dornbracht faucets can be either free-standing or wall-mounted. Combining the cubic forms we’ve seen previously with the brilliant white Corian, the Dornbracht faucets create a united bathroom design into which these faucets firmly belong. 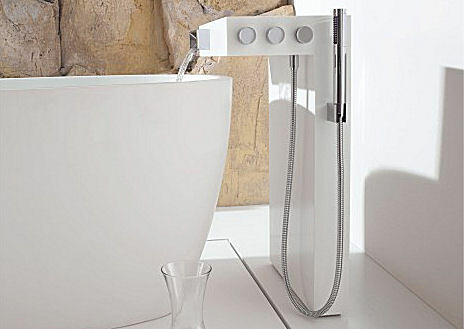 The KATA wall-mount bath fitting features a white Corian housing that stands proud of the wall. 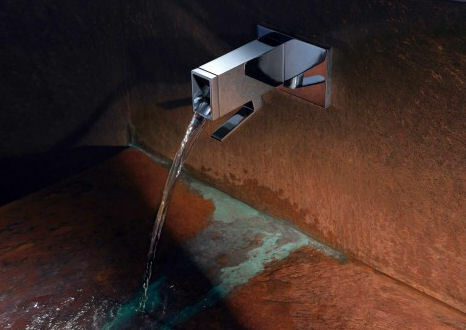 It features a cubic spout to one side that continues the reflective finish over flowing water. The brilliant metal controls add sparkle and shine to the smooth seamless finish of the Corian. 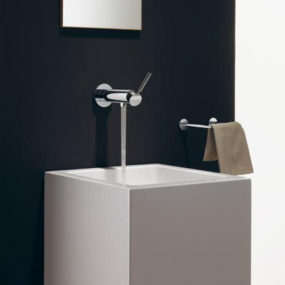 The NOTA free-standing bath fitting features many of these details but in a tall unique unit. 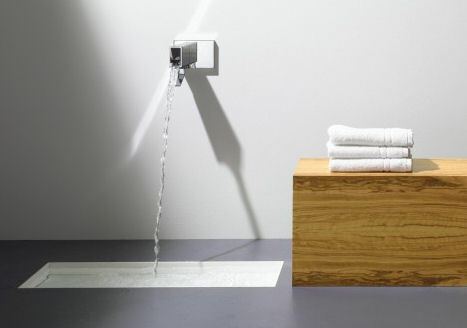 Here the Corian is used to create a free-standing pillar that cantilevers the faucet spout over the bath. The tower continues the cubic style of the Elemental Spa, but accents it with round metallic controls. With a strong presence, the light Corian defies the weight of such a solid form. Beautiful accents for the gorgeous copper lined baths, the KATA and NOTA fixtures continue the clean and open designs the Elemental Spa embraces. The seventh zone is called the ‘Heated Block’ which features a warm marble block which warms the body and relaxes stiff muscles. The eighth zone creates a serene and peaceful space in which to meditate and centre oneself. A sorely neglected aspect of personal health, the ‘Wooden Bench and Patio’ provide the space and environment to clean and clear your mind. Finally the Elemental Spa presents the ‘Spill Zone’, an unrestricted space that encourages the interaction and play of fluid for an elemental centrepiece. Progressing naturally from one zone to the other, the Elemental Spa offers a soothing ritual that provides a refreshing contrast to busy modern life.